The Complete Word Study Dictionary: New Testament by Spiros Zodhiates – I’m with Kenny Burchard on this one, though I prefer the Dictionary format vice the Word Study Bible format that Kenny recommended. The entries are extensive and helpful, but not so long (more like a Theological Dictionary than just a Lexicon) that it makes it difficult to use. And for those of you who don’t know greek, its numerically encoded with Strong’s numbers to help you out when looking up words. For a more straightforward lexicon check out Bill Mounce’s Analytical Lexicon of the Greek New Testament with shorter entries but no Strong’s numbers. The Interlinear NASB-NIV Parallel New Testament in Greek and English – I absolutely love this Interlinear and have used it as my “Go To” Greek New Testament for years! I did better much better in Greek than I did in Hebrew but my vocabulary is weak so I still use an Interlinear a lot when studying the NT in its original language. And this one is great because along with the Greek text and an interlinear literal translation, you have a dynamic equivalence translation on the left and a word-for-word translation on the right for comparison. ANYONE CAN USE AN INTERLINEAR! So Pastors, you have no excuse. However, if you want Strong’s numbers, though, you’ll have to get another Interlinear (just beware that almost all of those are King James/Textus Receptus based). The First Epistle to the Corinthians by Gordon D. Fee (NICNT) – An absolute masterpiece! His magnum opus! (Most authors only have one magnum opus, but Fee has at least one other) I’m pretty partial to the NICNT (and NICOT) series, because it is evangelical and scholarly, but easy to use (while Word series is good it takes a little more work to get at the bottom line – “so what does this mean?”) Here’s a couple other highlights in this series: P.C. Craigie on Deuteronomy, William Lane on Mark, and John Oswalt (2 vols.) on Isaiah. Old Testament Survey by LaSor, Hubbard & Bush – An absolute classic on “the message form and background of the Old Testament.” ‘Nuff said! A Theology of the New Testament by George Eldon Ladd – Anyone who has gone to Seminary in the last 40 years has read this! Besides they’ll take away my Fuller diploma if I don’t give honorable mention to Ladd! How To Read The Bible For All it’s Worth by Gordon Fee & Doug Stuart – In Seminary they told me that this wasn’t scholarly enough for them to assign as reading – who cares! Everyone who wants to read, understand and interpret the Bible faithfully should read this book (and at 10 bucks right now at CBD you should just go ahead and take the plunge)! Per Kenny, others in the “How to Read…” series are also worthy (e.g. Book by Book, How to Choose a Translation)! Systematic Theology by Wayne Grudem – I’m a Bible guy, not a systematics guy. And I’m sure that you can find plenty of Systematic Theologians out there who don’t like this volume (Grudem is a conservative scholar to be sure). But when I need to understand basic Christian Theology this is where I go for a fairly straightforward, orthodox overview on Systematic Theology topics (from a charismatic-reformed perspective). The Early Church by Henry Chadwick – The authoritative work on Early Church History! The Strongest Strong’s Exhaustive Concordance of the Bible – The classic updated & improved. Even laity should own this one! In addition to the comprehensive standard Concordance word look ups, you’ve got the numerically encoded Greek & Hebrew dictionaries (which anyone can use), and Nave’s Topical Bible Reference System, along with other helpful tools. The one linked here is KJV based, but its also available in NIV and NASB. Do me a favor though, when using the dictionaries, remember that everything after the dash gives every single translation of that word in the KJV. But you cannot conclude that in your specific instance of the word under study in that particular verse that it means all those things (a common error) – there’s reason it was translated differently in those other instances (Hint: context). 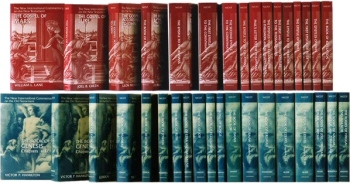 Dictionary of Jesus & the Gospels, ed. Joel Green – Along with a Concordance, Commentary and a good solid Study Bible, everyone should have a Bible Dictionary. And the IVP Dictionary Series is an incredible resource, but it’s gonna set you back a pretty penny (currently $289.99 at CBD)! The International Standard Bible Encyclopedia is a strong alternative ($179.99 – or it’s included in a lot of your standard Bible software packages like BibleWorks and Logos). Truth is you can get by just fine with Eerdman’s Bible Dictionary ($34.99). So what did I miss? Let me know in the comments below! Oh, and may God bless you as you “labor in the word and doctrine” (1 Tim. 5:17, NKJV), preparing your sermon this week! Here it is folks! I just spied the Hendriksen-Kistemaker New Testament Commentary set that I mentioned above for $50 (all 12 volumes in electronic format)! On Sale this weekend, so move quickly! Oh no, you did state it clearly in the title. I just thought that you strayed off the path a bit (depending on how far one wants to stretch the definition of Reference books) and I was trying to be a purist. But then I probably did stray a bit too (e.g. Is a Systematic Theology text really a Reference book?!?) – LOL! No worries.